Strategy Management bridges the gap between an organization’s Strategy Execution and Performance Management. 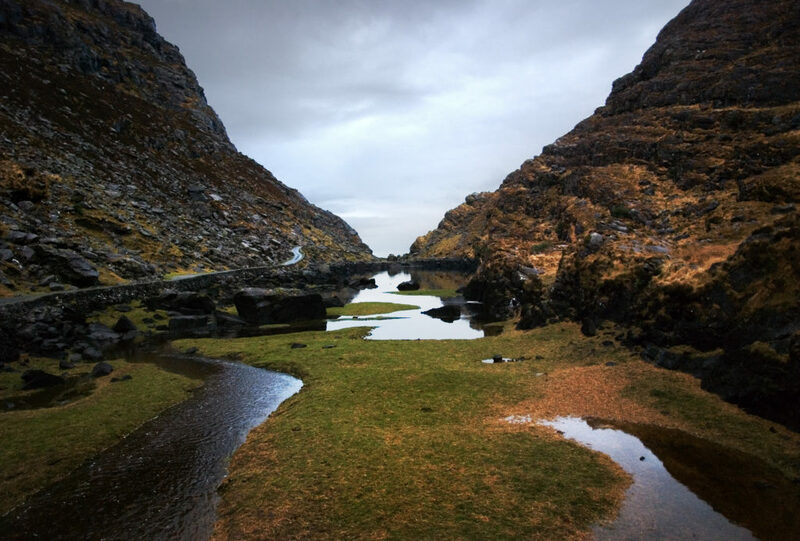 This bridge links the strategic initiatives, defined by its leadership team to gain competitive advantage, to the “No Excuses” individual associate level goals required to achieve them. Executional excellence, the number one challenge facing corporate leaders throughout the world today, depends on their organization’s ability to bridge this gap. The best strategies are worthless when they aren’t executed. Any shortfall between the strategic plan and actual results achieved is referred to as the Strategy Management Gap. The wider an organization’s gap, the worse their financial performance will be from plan. Ironically most organizations don’t even attempt to measure their Strategy Management Gap. According to Mankins (2005, p. 2) “less than 15% of companies make it a regular practice to go back and compare” their actual performance to their long-term strategic plans. Those organizations that measure their strategic performance typically do so in a piecemeal fashion via a myriad of disparate business applications. Organizations that rely on legacy ERP or HRIS systems will not have the information required to quantify the size of their Strategy Management Gap, nor to identify a means for bridging it. So why do most organizations fail to measure their Strategy Management Gap when the cost for not bridging it is so great? One answer lies in the old axiom “What gets measured, gets done”. Managers typically focus more on what they can measure, rather than on what they can’t. Achievements from executing higher level strategies focused on global optimums are hard to quantify. Conversely, achievements from executing lower level tactics and goals that focus on local optimums are easy to quantify. This results in more emphasis being placed on the lower level goal achievements, than higher level strategies, even though a small improvement on a strategic initiative typically has a greater impact on financial performance than a large improvement on a lower level goal. The purpose of this paper is to review the symptoms and causes of the Strategy Management Gap, and provide a simple tool for measuring your GAP. Doing so will help you develop a better understanding of the problems caused by the Strategy Management Gap and the basis for estimating how much the gap is negatively impacting your financial performance. Assuming the first step in solving any problem is to properly define it, estimating your organization’s SMG is a great place to start. Although measuring your organization’s Strategy Management Gap is hard to do, identifying its symptoms is relatively easy. Answering the following list of questions will help determine if a gap exists in your organization. You can answer them with a simple yes/no, or estimate the percentage of the time these problems exist. Are your strategic plans viewed as the “flavor of the month” that are forgotten shortly after they have been promoted? Have you regularly missed revenue or profit targets? Do your customers complain about poor quality, poor service, or past due shipments? Are any of your strategic projects completed late or over-budget? Do you focus more effort on performance measurement than you do on performance management? Do your associates understand how their assigned goals align with the organization’s strategy? Are your associates ever confused on what they are being held accountable for? Are there differences between an associate’s perception of their performance and the annual ratings they receive from their boss or peers? Answering yes to any of these questions is indicative that your organization is suffering from a Strategy Management Gap. Although there is no scale, the more yeses you answer, or the greater the estimated problem percentage, the wider your Strategy Management Gap is. Effective strategy management must begin with a viable strategy. A viable strategy must be aligned with the organization’s Vision, Mission, Core Competencies and Values. It must also be achievable based on the organization’s available resources. In most organizations, strategic planning is not a process, but a negotiation that begins between financial executives and the individual business unit managers. The business unit managers typically focus on short-term plans due to their own annual compensation and bonus programs. These managers attempt to negotiate the most conservative operating plans that the financial executives are willing to approve. This politicking makes it easier for the operations managers to maximize their bonuses when the annual results exceed their understated short-term plans. Immediately after the financial executives sign off on the short-term operating plans with the business unit managers, they must negotiate with the organization’s owners or Board of Directors to establish the long term strategic plans. Financial executive’s short-term job security improves when they acquiesce to the owner’s political pressure to establish overly optimistic long-term strategic plans. Typically, annual budgets control spending for capital resources. These tightly controlled annual budgets will not support the lofty demands of the overstated long-term strategic plans. This politically driven disconnect further undermines the opportunity to hold anyone in the organization accountable. Rather than establishing a viable strategy, management has approved a dysfunctional one resulting in a sizable Strategy Management Gap before execution is even planned. Because Strategy Execution is driven by the leadership team, while Performance Management is relegated to Human Resources, these functional silos contribute to the Strategy Management Gap. Not only are these processes driven by different functions, the functions are headed by opposite ends of the organization hierarchy. These diverse functions often have different metrics and other performance incentives. Functional silos throughout an organization will make alignment of associate goals more challenging. Silos also have a negative impact on the goal alignment in project centric organizations. Project Managers struggle with each other when the same teammate is shared across more than one cross-functional team. Even process driven organizations can be negatively impacted by functional silos. In most cases, from the time a customer order is received, until it’s fulfilled, it must pass through multiple departments, run as functional silos by different managers. Strategy Management bridges the gap in traditional organizations as well as those that are project and/ or process centric. In most cases, organizations do a good job communicating their strategy, but are much worse at translating and assigning it to lower level associate goals. Common mistakes made assigning goals include poor definition (i.e. scope), a lack of Owner understanding, failure to seek Owner agreement and assigning the same goal to more than one Owner. When more than one owner is assigned responsibility for the same goal, finger pointing can occur with no one being held accountable. The assignment problem compounds itself when management can’t determine whether the root cause of unsatisfactory performance is due to unattainable or poorly aligned strategies, dysfunctional assignment, poor execution, or any combination of these issues. Consequently, poorly assigned goals rarely produce the intended results. Associates throughout the organization simply do not know what they are expected to do, or when they are supposed to do it. Finger pointing becomes rampant when these associates don’t understand the scope of their authority, or when the assigned tasks are beyond their capabilities to achieve them. No one can be held accountable for the shortfall in performance that contributes to the Strategy Management Gap. Assuming organizations do a good job aligning and assigning associate level goals, their next potential pitfall is dysfunctional management. Goal management is required throughout the life of a goal to assure that corrective actions are taken as unforeseen issues arise. To be successful, this is where organizations require agility. Although most emphasis is placed on the goal owners or assignees to achieve the scoped requirements, the goal managers or assignors also play a very important role. Goal managers are typically hierarchal bosses in traditional organizations or Project Managers in matrix based organizations. These bosses and managers are responsible for defining the goal’s scope, assigning it to the responsible Owner, providing the necessary resources, monitoring progress, documenting corrective actions and assessing performance upon completion. Goal owners should be held accountable for reporting their Prior Actions, Current Risks and Future Plans, required to achieve their goal. Failure to manage both assignor manager and assignee owner roles results in dysfunctional goal management. Teamwork and accountability also contribute to the dysfunctional management of assigned goals. Think about what associates typically do when routinely asked for help by their teammates. In most cases, associates asked to help their teammates agree to do so for several reasons. First, saying “No” immediately disappoints or angers the teammate soliciting help and may result in an argument or confrontation. Most associates have a tendency to avoid conflict. Second, organizational norms typically encourage associates to be good teammates. Good teammates are encouraged to help their peers. Third, in the absence of associate level accountability, no one is accountable anyway. Finally, when associates routinely agree to help their teammates, they often use this perfunctory tendency to say “Yes” as an ongoing excuse to be chronically late on prior commitments. In the absence of an effective strategy management process, the reinforcing loop between teamwork and accountability widens the Strategy Management Gap. Associates will appear to be good teammates by agreeing to help their peers and then use these additional assignments as an excuse when their boss or other peers attempt to hold them accountable for prior commitments. Implementing a formal strategy management process that translates the organization’s strategic plans into concisely defined tasks assigned to each associate is the first step in achieving accountability. Associates that have clearly assigned tasks holding them accountable for results, also have a rational basis for telling teammates “No” when asked for help. When an organization develops a culture of accountability, associates respect their teammate’s prior commitments and understand why they are often told “No” to new requests for help. Eliminating the teamwork/accountability reinforcing loop can only occur when an effective formal strategy management process is implemented. Effective achievement can only occur when the prior goal alignment, assignment and management steps have been successfully completed. Achievement should only be measured when a goal is completed. Too often a goal is believed to be almost complete, only to discover problems that can cause major setbacks. It is important that all Stakeholders of a goal play a role in the assessment process. Sometimes known as a 360 degree review, Stakeholders may be teammates, providers or customers. In addition to the boss or Project Manager, these Stakeholders are in a great position to fairly rate the assigned associate’s performance for a completed goal. It is important that the Stakeholders who rate goals have access to contemporaneous notes that document the ongoing actions taken by the assigned associate to achieve their goal. These notes prevent short term memories from distorting the fair assessment of associate performance. The dysfunctional assessment of associate performance can result in an underperforming organizational culture. It doesn’t matter if the problem is caused by politically driven strategies, functional silos, a lack of associate accountability or poor management. Associates across a dysfunctional organization know that the poorly defined strategic plans will not be executed. They have been set up to fail, resulting in their total lack of commitment. Promises to complete poorly assigned tasks are routinely broken without adverse consequences. Management cannot tell their star performers from the unaccountable slackers. Star performers that go unrecognized seek employment elsewhere, leaving the slackers to run the organization. Failure to address the Strategy Management Gap caused by dysfunctional goal achievement negatively impacts an organization’s financial performance. Unattended gaps can become so wide that the organization’s long-term survival is at risk. 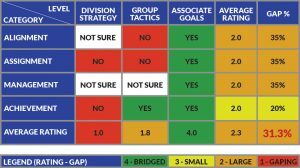 The Strategy Gap Analysis (SGA) subjectively measures your organization’s strategy gap. Completing the SGA is a great exercise for any management team, as long as they are willing to be objective when measuring their own performance. Our experience has shown that management teams readily identify symptoms that suggest they have a Strategy Management Gap that needs bridging. However, when these same management teams complete their SGA, their subjective self-ratings do not indicate much of a gap. Management teams, especially when the boss is present typically are not very objective or self-critical of their own performance. If your organization has symptoms of a strategy management gap, but a relatively high SGA rating by the management team, we suggest expanding the SGA to a larger cross section of the organization’s associate population. Assuming you can obtain candid feedback from your associates without their fear of retaliation, the expanded SGA will probably confirm the existence of a much greater Strategy Management Gap. Providing simple Yes / No / Not Sure responses to 12 questions about your organization is all it takes to complete the SGA. The Legend appearing below the spreadsheet shows that ratings must be from 1-4. A rating of 4 indicates that the Strategy Management Gap has been bridged. Conversely, a rating of 1 indicates that the Strategy Management Gap is gaping. Each rating is color coded making it easier to visually see where an organization needs to bridge their gap. The key to strategy management is to get everyone in the organization on the same page. The columns on the SGA spreadsheet indicate the different levels of goals that must be aligned with the selected strategies. The Division Strategies appear in the first column, followed by the Group Tactics and Associate Goals in the third column. This is the same way that Vision2Reality cascades Division Strategies and aligns them with lower level Group Tactics and associate level “No Excuses” goals. Associates must know how each of their assigned goals relates to and supports their higher level Group Tactics and Division Strategies. The rows in the spreadsheet identify the primary elements that must be in place to bridge the Strategy Management Gap. Strategy Management begins with Alignment of all Division, Group and Associate level goals. This is followed by the Assignment of these aligned goals to the responsible associates throughout the organization. The assigned goals must then be managed so unanticipated problems are quickly resolved. Lastly, the level of Achievement for all completed goals must be assessed. Effective Strategy Management requires that all four of these elements (i.e. Alignment, Assignment, Management, and Achievement) must be in place to bridge the Strategy Management Gap. Working individually or as a team rate your organization’s effectiveness based on these parameters. Any area rated less than great presents an opportunity to bridge your organization’s Strategy Management Gap transforming your plans to realities. When more than one associate from an organization completes the SGA, Vision2Reality will provide an organization summary report free of charge. Just follow the instructions included with the SGA. Should you need any assistance completing your SGA, interpreting the results or deciding what you should do next, please contact Vision2Reality. Why Is Strategy Management So Important? Vision2Reality has developed a web based, user friendly Strategy Management (SM) application that seamlessly bridges the gap between Strategy Execution and Performance Management.